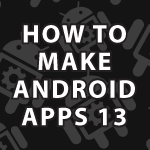 In this tutorial I’ll finish up the Android Fragment example I started in part 12. Watch part 12 first. Here is the entire package available for download. This time will cover how to switch to either an Activity if we are in portrait mode, or how to change the hero data dynamically on the screen if we are in horizontal mode. This is a very useful technique to learn. All of the code follows the tutorial below. What is a general rule of thumb concerning new classes? What constitutes creating and not creating a new class. You should turn everything possible into an object and those objects should model the real world. I cover that in detail in my object oriented design tutorial. Probably you have answered these questions in some comments but would you tell me when you will continue your android tutorial and should I learn PHP in order to develop android apps. I’ll upload a video on MySQL and then web services. Then I’ll get into how to use web services with Android. Then I’ll make a bunch of Android tutorials in a row. Sorry about the wait. I have been overwhelmed with work for the past month. Make a good android jni tutorial! great job!!! is it the last part of the tutorial? if not , what come next? why do you import android.app.Fragment in details fragment code and not android.support.v4.app.Fragment as we did last time? is there a difference between the two imports ? when do we use each one ? The support library is backwards compatible. I was just showing the different options. Have you tried building any “androidTest” modules in Android Studio. I have to admit that right from the git-go I find the testing structure under A.S. very confusing. All of the testing documentation assumes that you are building a new package just at the /src level, but it seems that A.S. is only building a new .apk at the /app level. Also A.S. doesn’t automatically build new AndroidManifest.xml or gradle or other template structures, and I’m wandering if I’m interpreting correctly that I must manually build them, or if there are ‘as yet’ undiscovered switches in the build files that I should use to construct my test files from a different target in the same build files. Just writing this has given me some ideas, but any insights you might have would be great. I’ll be making many videos on testing very soon. Sorry about the wait. Can you please provide me with some hints how can I add icons and color to the listview you have created in the above code.